Sulfobacillus acidophilus Norris et al. 1996 is a member of the genus Sulfobacillus which comprises five species of the order Clostridiales. Sulfobacillus species are of interest for comparison to other sulfur and iron oxidizers and also have biomining applications. 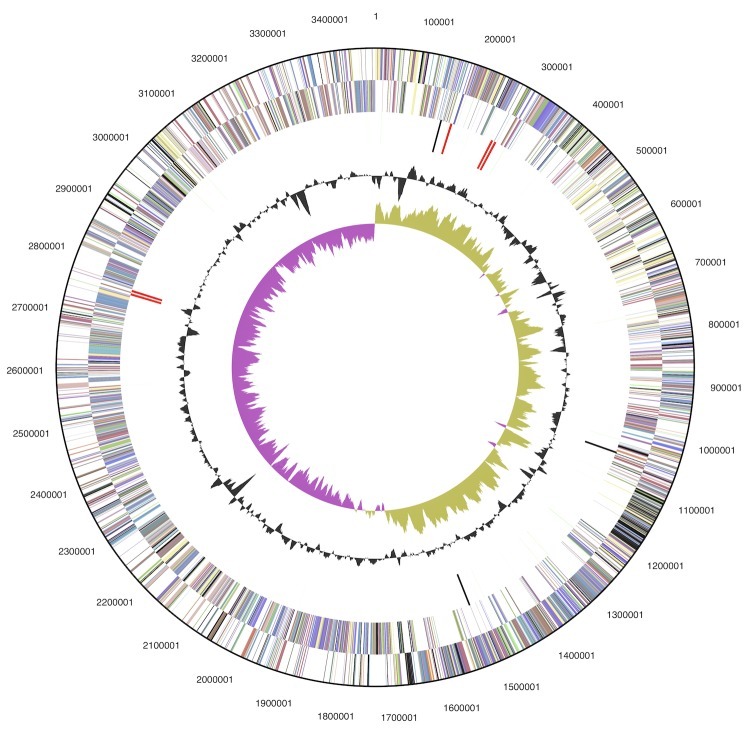 This is the first completed genome sequence of a type strain of the genus Sulfobacillus, and the second published genome of a member of the species S. acidophilus. The genome, which consists of one chromosome and one plasmid with a total size of 3,557,831 bp harbors 3,626 protein-coding and 69 RNA genes, and is a part of the Genomic Encyclopedia of Bacteria and Archaea project. The genus Sulfobacillus currently consists of five species , all of which are mildly thermophilic or thermotolerant acidophiles . Sulfobacilli grow mixotrophically by oxidizing ferrous iron, sulfur, and mineral sulfides in the presence of yeast extract or other organic compounds . Some can also grow autotrophically [2,3]. The strains that have been tested are capable of anaerobic growth using Fe+3 as an electron acceptor [2,4]. 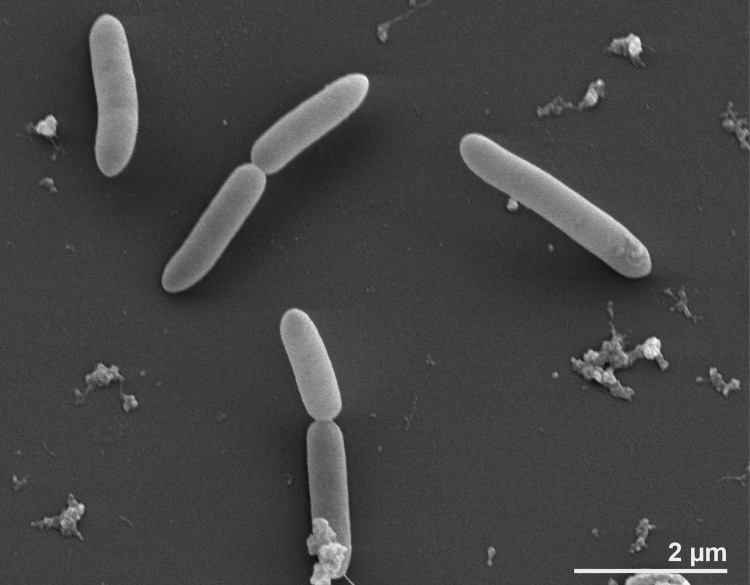 The genus Sulfobacillus, along with the genus Thermaerobacter, have only tentatively been assigned to a family, “Clostridiales Family XVII incertae sedis”. This group may form a deep branch within the phylum Firmicutes or may constitute a new phylum . Strain NALT (= DSM 10332 = ATCC 700253) is the type strain of the species Sulfobacillus acidophilus. The genus name was derived from the Latin words 'sulfur' and 'bacillus' meaning 'small sulfur-oxidizing rod' . The species epithet is derived from the Neo-Latin words 'acidum', acid, and 'philus', loving, meaning acid-loving . The first genome from a member of the species S. acidophilus, strain TPY, which was isolated from a hydrothermal vent in the Pacific Ocean, was recently sequenced by Li et al. . Here we present a summary classification and a set of features for S. acidophilum strain NALT, together with the description of the complete genomic sequencing and annotation. A representative genomic 16S rRNA sequence of S. acidophilus NALT was compared using NCBI BLAST [8,9] under default settings (e.g., considering only the high-scoring segment pairs (HSPs) from the best 250 hits) with the most recent release of the Greengenes database  and the relative frequencies of taxa and keywords (reduced to their stem ) were determined, weighted by BLAST scores. The most frequently occurring genera were Sulfobacillus (81.9%), Thermaerobacter (8.0%), Laceyella (2.8%), 'Gloeobacter' (2.1%) and 'Synechococcus' (2.0%) (76 hits in total). Regarding the six hits to sequences from members of the species, the average identity within HSPs was 98.9%, whereas the average coverage by HSPs was 97.2%. Regarding the 23 hits to sequences from other members of the genus, the average identity within HSPs was 93.1%, whereas the average coverage by HSPs was 81.2%. Among all other species, the one yielding the highest score was “Sulfobacillus yellowstonensis” (AY007665), which corresponded to an identity of 99.4% and an HSP coverage of 97.0%. (Note that the Greengenes database uses the INSDC (= EMBL/NCBI/DDBJ) annotation, which is not an authoritative source for nomenclature or classification.) The highest-scoring environmental sequence was HQ730681 ('Microbial Anaerobic Sediments Tinto River: Natural Acid and Heavy Metals Content extreme acid clone SN1 2009 12D'), which showed an identity of 94.5% and an HSP coverage of 99.0%. The most frequently occurring keywords within the labels of all environmental samples which yielded hits were 'acid' (4.8%), 'soil' (4.5%), 'hydrotherm' (3.7%), 'microbi' (3.7%) and 'mine' (3.0%) (172 hits in total). These keywords correspond well to the environment from which strain NALT was isolated. Environmental samples that yielded hits of a higher score than the highest scoring species were not found. Figure 1 shows the phylogenetic neighborhood of S. acidophilus NALT in a 16S rRNA based tree. The sequences of the five 16S rRNA gene copies in the genome differ from each other by up to eight nucleotides, and differ by up to four nucleotides from the previously published 16S rRNA sequence (AB089842), which contains two ambiguous base calls. 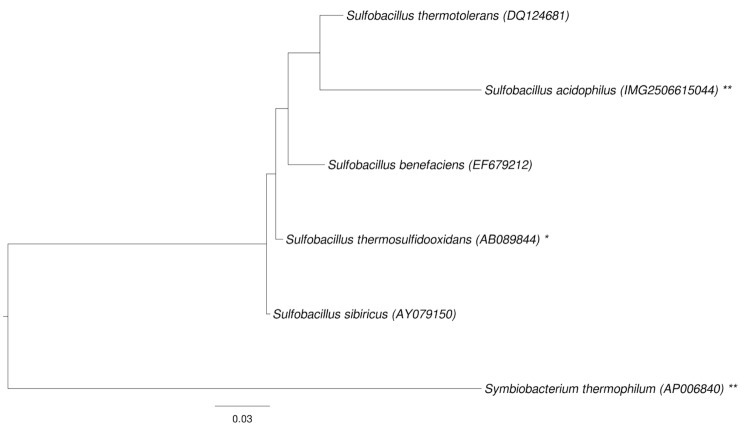 Phylogenetic tree highlighting the position of S. acidophilus relative to the type strains of the other species within the genus Sulfobacillus. The tree was inferred from 1,422 aligned characters [12,13] of the 16S rRNA gene sequence under the maximum likelihood (ML) criterion . The comparatively closely related genus Symbiobacterium  was included for rooting the tree. The branches are scaled in terms of the expected number of substitutions per site. Numbers adjacent to the branches, if any, are support values from 1,000 ML bootstrap replicates  (left) and from 1,000 maximum parsimony bootstrap replicates  (right) if larger than 60% (i.e., there were none). Lineages with type strain genome sequencing projects registered in GOLD  are labeled with one asterisk, those also listed as 'Complete and Published' with two asterisks . Cells of S. acidophilus NALT are rods 3.0-5.0 μm in length and 0.5-0.8 μm in width (Table 1 and Figure 2) . Cells are Gram-positive and form spherical endospores . Flagella were not observed . Strain NALT was found to grow between 28°C and 62°C with an optimum at 48°C . The upper and lower temperatures for growth were not determined but were predicted to be 10°C and 62°C . The pH range for growth was 1.6-2.3 with an optimum at 1.8 . Three strains of S. acidophilus have been found to be facultative anaerobes that are able to use Fe+3 as an electron acceptor under anaerobic conditions ; but strain NALT was not tested in this study. Strain NALT can grow autotrophically or mixotrophically by oxidizing Fe+2, sulfur, or mineral sulfides or heterotrophically on yeast extract . S. acidophilus and other sulfobacilli have potential applications in biomining. Strain NALT increased the leaching of numerous mineral sulfides , however, its sensitivity to low concentrations of metals may limit its usefulness in biomining . Classification and general features of S. acidophilus NALT according to the MIGS recommendations  and the NamesforLife database . S. acidophilus strain NALT, DSM 10332, was grown in DSMZ medium 709 (Acidomicrobium medium)  at 45°C. DNA was isolated from 0.5-1 g of cell paste using MasterPure Gram-positive DNA purification kit (Epicentre MGP04100) following the standard protocol as recommended by the manufacturer with modification st/LALM for cell lysis as described in Wu et al. 2009 . DNA is available through the DNA Bank Network . The genome was sequenced using a combination of Illumina and 454 sequencing platforms. All general aspects of library construction and sequencing can be found at the JGI website . Pyrosequencing reads were assembled using the Newbler assembler (Roche). The initial Newbler assembly consisting of 104 contigs in three scaffolds was converted into a phrap  assembly by making fake reads from the consensus, to collect the read pairs in the 454 paired end library. Illumina GAii sequencing data (599.7 Mb) were assembled with Velvet  and the consensus sequences were shredded into 1.5 kb overlapped fake reads and assembled together with the 454 data. The 454 draft assembly was based on 143.7 Mb of 454 draft data and all of the 454 paired-end data. Newbler parameters were -consed -a 50 -l 350 -g -m -ml 20. The Phred/Phrap/Consed software package  was used for sequence assembly and quality assessment in the subsequent finishing process. After the shotgun stage, reads were assembled with parallel phrap (High Performance Software, LLC). Possible mis-assemblies were corrected with gapResolution (C. Han, unpublished), Dupfinisher , or sequencing cloned bridging PCR fragments with subcloning. Gaps between contigs were closed by editing in Consed, PCR and Bubble PCR primer walks (J.-F. Chang, unpublished). A total of 640 additional reactions and eight shatter libraries were necessary to close gaps and to raise the quality of the finished sequence. Illumina reads were also used to correct potential base errors and increase consensus quality using the software Polisher developed at JGI . The error rate of the completed genome sequence is less than 1 in 100,000. Together, the combination of the Illumina and 454 sequencing platforms provided 219.6 × coverage of the genome. The final assembly contained 612,059 pyrosequence and 16,626,072 Illumina reads. The genome consists of one circular chromosome of 3,472,898 bp and one circular plasmid of 84,933 bp length with an overall G+C content of 56.8% (Table 3 and Figures 3 and 4). Based on coverage of 454 paired ends, the plasmid may be inserted into the chromosome in about half of the population. Of the 3,695 genes predicted, 3,626 are protein-coding genes, and 69 are RNAs; 155 pseudogenes were also identified. The majority of the protein-coding genes (68.3%) were assigned a putative function while the remaining ones were annotated as hypothetical proteins. The distribution of genes into COGs functional categories is presented in Table 4. Graphical map of the chromosome. From outside to the center: Genes on forward strand (colored by COG categories), Genes on reverse strand (colored by COG categories), RNA genes (tRNAs green, rRNAs red, other RNAs black), GC content, GC skew. 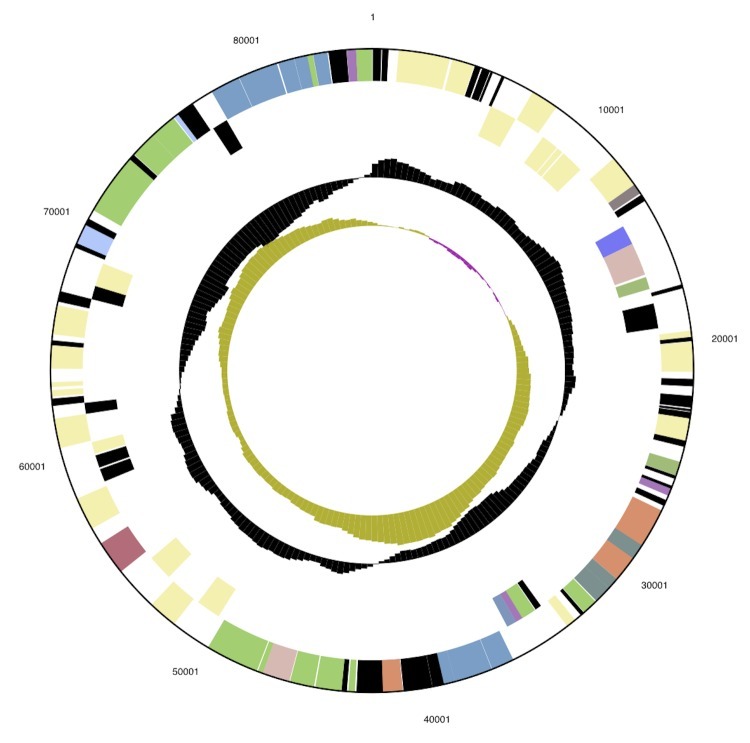 Graphical map of the plasmid. From outside to the center: Genes on forward strand (colored by COG categories), Genes on reverse strand (colored by COG categories), RNA genes (tRNAs green, rRNAs red, other RNAs black), GC content, GC skew. a) The percentage is based on the total number of protein coding genes in the annotated genome. While the sequencing of the genome described in this paper was underway, Li et al. from the Third Institute of Oceanography, Xiamen, China published the complete genome sequence of strain TPY . The two genomes differ in size by less than 7,000 bp. Here, we take the opportunity to compare the completed genome sequences from these two stains, NALT and TPY, both belonging to S. acidophilus. While the biological material for the type stain, NALT, is publicly available from the DSMZ open collection for postgenomic analyses, no source of the biological material (MIGS-13 criterion, see Table 2) of strain TPY was provided by Li et al. .
To estimate the overall similarity between the genomes of strains NALT and TPY (Genbank accession number: CP002901), the GGDC-Genome-to-Genome Distance Calculator [50,51] was used. The system calculates the distances by comparing the genomes to obtain HSPs (high-scoring segment pairs) and interfering distances from three formulae (HSP length / total length; identities / HSP length; identities / total length). The comparison of the genomes of strains NALT and TPY revealed that 99.65% of the average of the genome lengths are covered with HSPs. The identity within these HSPs was 99.01%, whereas the identity over the whole genome (counting regions not covered by HSPs as non-identical) was 98.67%. The inferred digital DNA-DNA hybridization values for the two strains are 96.47% (formula 1 in ), 86.08% (formula 2 in ) and 97.05% (formula 3 in ), respectively. These results clearly demonstrate that according to the whole genome sequences of strains NALT and TPY, the similarity is very high, supporting the membership of both strains in the same species. The comparison of the number of genes belonging to the different COG categories revealed few differences between the genomes of strains NALT and TPY. Strain NALT has 2,740 genes with COGs assigned, while strain TPY has 2,700. We analyzed the differences in COG assignment between the two strains and found that in almost all cases they could be explained by differences in the gene calls or pseudogene assignment, i.e. in one genome two parts of a pseudogene were called as two separate genes, while in the other genome they were combined into one pseudogene. The only clear case of a difference in gene content between the two strains is the presence of a transposable element consisting of two genes (Sulac_1668, Sulac_1669) disrupting a subunit of a potassium transporter (Sulac_1667) in strain NALT. There were also cases where a gene in one strain was split into two genes in the other strain. For example, Sulac_2178 corresponds to TPY_1983 and TPY1984, and Sulac_0347 corresponds to TPY_0381 and TPY_0382. In both cases the differences are due to a single base indel. A dot plot showed that there are large blocks of synteny between the two genomes with some rearrangements (data not shown). The genes found on the plasmid in strain NALT are found in two regions of the chromosome in strain TPY. Sulac_3528-3555 corresponds to TPY_0524-0552, while Sulac_3556-3626 corresponds to TPY_2310-2244. This suggests that in strain TPY, the plasmid was inserted into the chromosome and then split into two pieces. We analyzed CRISPR repeats with the CRISPR Recognition Tool  and found major differences between the two strains. They both have two regions of CRISPR repeats, but the strain TPY repeat regions have 8 and 9 repeats while the strain NALT repeat regions have 27 and 43 repeats. All of the spacers in the TPY repeat regions are found in NALT, but NALT has many additional spacers. This agrees with previous results suggesting that CRISPRs evolve quickly, and differences can be found in closely related strains . We would like to gratefully acknowledge the help of Gabriele Gehrich-Schröter for growing S. acidophilus cultures and Susanne Schneider for DNA extraction (both at DSMZ). This work was performed under the auspices of the US Department of Energy Office of Science, Biological and Environmental Research Program, and by the University of California, Lawrence Berkeley National Laboratory under contract No. DE-AC02-05CH11231, Lawrence Livermore National Laboratory under Contract No. DE-AC52-07NA27344, and Los Alamos National Laboratory under contract No. DE-AC02-06NA25396, UT-Battelle and Oak Ridge National Laboratory under contract DE-AC05-00OR22725, as well as German Research Foundation (DFG) INST 599/1-2. Ludwig W, Schleifer KH, Whitman WB. Revised road map to the phylum Firmicutes. In: Bergey's Manual of Systematic Bacteriology, 2nd ed., vol. 3. De Vos P, Garrity G, Jones D, Krieg NR, Ludwig W, Rainey FA, Schleifer KH, Whitman WB (eds). 2009. Springer-Verlag, New York. pp. 1-13. BAuA. Classification of Bacteria and Archaea in risk groups. TRBA 466. p. 227. Bundesanstalt für Arbeitsschutz und Arbeitsmedizin, Germany. 2010.